Twin sisters Shruti & Gore Bhatla, from Kanpur District, who suffer from ‘ontogenesis imprecate’, a type of incurable bone disease are recipients of the National Bal Shree Awards, 2007, for their creative talents. Their creativity, cheerful nature and indomitable spirit impressed Smt. Pratibha Patil immensely, and she thereafter met them along with their parents during her visit to Kanpur. The parents of Shruti and Gore informed Smt. Pratibha Patil about their difficulties in meeting medical expenses and getting treatment at a specialized hospital. Her intervention helped them receive some medical relief from the State Government. Pinki, a school girl from a remote part of rural Chhattisgarh has the ingenuity of making useful items from waste products. Her innovative ideas impressed Smt. Pratibha Patil. 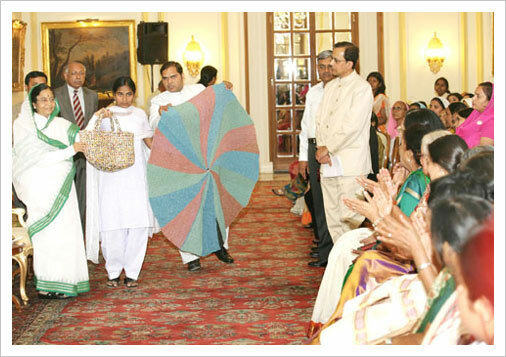 She was invited to showcase her products at Rashtrapati Bhavan on the occasion of International Women’s Day in March 2009. Pinki eventually became a master trainer to various Self-Help Groups. A visit to Rashtrapati Bhavan opened a new vista of opportunities for her. More than hundred children from underprivileged sections of society and orphans from different organizations and orphanages in the city were given a surprise by Smt. Pratibha Patil, when she hosted them for a lunch at Rashtrapati Bhavan. She wanted the children to have an opportunity to go around Rashtrapati Bhavan and the Mughal Gardens and made sure that the children were given special care on this occasion. Smt. Pratibha Patil spent time with the children, and tried to understand their experiences and urged them to take their education seriously, as they are the future of the nation. The brave feats of several girls from a tribal-dominated district of Purulia in West Bengal who resisted child marriage and wanted to continue their education touched Smt. Pratibha Patil’s heart. Rekha Kalindi, Afsana Khatun and Sunita Mahala, all reached Rashtrapati Bhavan along with their parents and the District officials, who came forward to help them to continue their education. After meeting Smt. Pratibha Patil, laurels started pouring in for them for their courage, determination, and perseverance in the face of adversity, and today they are role models to many such girls, who want to move ahead in life. Inspired by the trio, more girls followed their example and some of them again visited Rashtrapati Bhavan. Roshni Devi, the bold village Sarpanch of Kothal Khurd of District Mahendragarh of Haryana, motivated and persuaded members of Panchayat and women of the village to launch a campaign against alcoholism and closed a liquor shop in the village to prevent men from drinking and wasting money on such habits. Several NGOs joined their movement. Their united campaign forced the Excise Dept of Haryana to close down the shop. Smt. Pratibha Patil, who always considers drinking as one of the social evils that destroy family life, was impressed by their remarkable feat and called the entire group of women to Rashtrapati Bhavan and lauded their efforts. Smt. 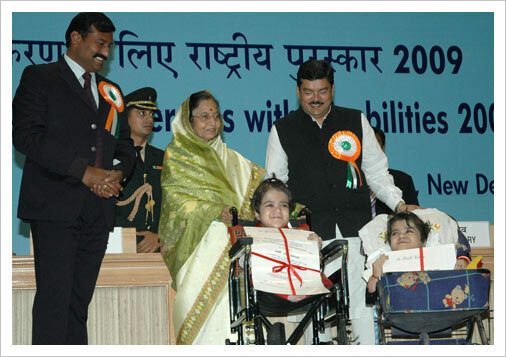 Pratibha Patil felicitated them on July 11, 2009 at Rashtrapati Bhavan. The Ministry of Social Justice & Empowerment later made a film on Roshni Devi and her campaign against alcoholism. The proverb, charity begins at home is true for Kantha Singh, the Good Samaritan whose poor economic condition did not stand in the way of his philanthropy. A mechanic, he opened an orphanage to help boys and girls of his area in the backward district of East Singhbhum in Jharkhand. He sought help from local people since his meager income was far from enough to keep his efforts going. Smt. Pratibha Patil, touched by his philanthropic bent of mind, invited him and the children to RashtrapatiBhavan. It was a unique experience for the children who could visit Rashtrapati Bhavan and dine with her. Sarjana, a young girl from Kolkata, was deeply moved by the plight of the victims of the devastation following the damage caused by cyclone Aila and collected money for relief, through song and dance performances on railway platforms, in railway carriages, and through her performance on Doordarshan on Children’s Day. Sarjana sent a letter to Smt. Pratibha Patil saying she wanted to donate collected by her, to the Smt. 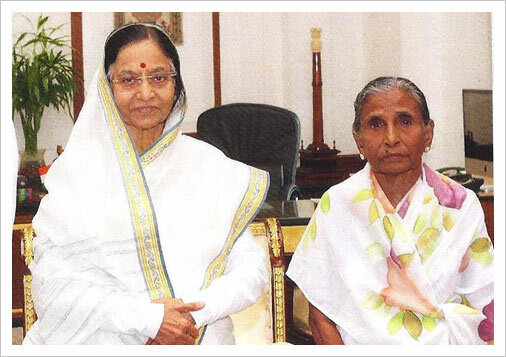 Pratibha Patil for the benefit of the natural calamity – affected people. Though the amount was small, the Smt. 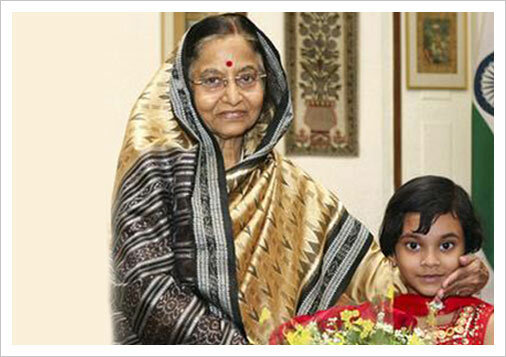 Pratibha Patil was touched by the compassionate gesture of this five-year-old girl. Laxmanrao from Vidarbha in Maharashtra came to Delhi, way back in 1975 with just Rs. 40 in his pocket, and started doing odd jobs and eventually opened a roadside tea stall near the Income Tax Office. He continued to work, completed his education and also fulfilled his ambition of writing books. Laxman has 20 novels to his credit. His life itself is a novel. Smt. Pratibha Patil met him at the Rashtrapati Bhavan on July 23, 2009, and appreciated his creative talent while accepting a copy of his book ‘Renu’. The book is about a woman’s trials and tribulations and her struggles to overcome them. He now publishes his books under the banner of Bharitiya Sahitya Kala Prakashan. Laxmi Indira Panda, a freedom fighter who was with the Rani Jhansi Regiment of the Azad Hind Fauj, had been virtually reduced to doing menial work for her survival due to her acute poverty. She had no family to look after her. When she came to meet Smt. Pratibha Patil, along with a well-wisher she was promptly given some monetary help. The matter of her freedom fighter’s pension was taken up with the State as well as the Government of India. Smt. Pratibha Patil also extended her a helping hand for the treatment of Laxmi Panda when she was brought to Delhi in a very critical condition, and admitted in AIIMS where she passed away on October 6, 2008. Smt. Pratibha Patil expressed grief on the demise of Laxmi Panda and lauded her contribution to the freedom struggle. An Economics graduate from the prestigious St. Xavier’s College in Mumbai, Siddhi Desai lost her eyesight because of a reaction to a medicine when she was six. The very first feeling of being blind was very frightening to Siddhi but she could overcome fear with the support of her mother. She cleared every examination with flying colors. Siddhi’s mother, who lost her husband when both her daughters were just kids, struggled hard to ensure that her two young daughters could pursue education. Smt. 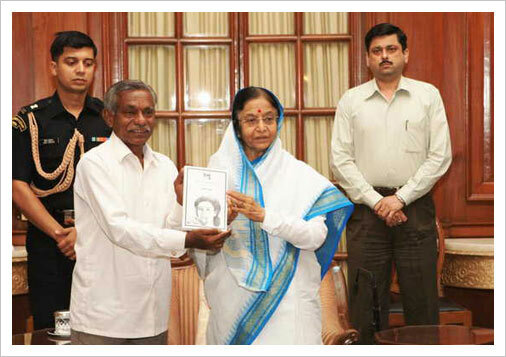 Pratibha Patil, touched by remarkable feat of Siddhi, met her at Rashtrapati Bhavan and also received a copy of the book entitled “WHY NOT I” based on the life of Siddhi. Anita Narre’s bold gesture of refusing to stay at her in-law’s house after her marriage, due to lack of proper sanitation facilities initiated a strong movement on rural sanitation. The news of her courage and bold stand impressed Smt. Pratibha Patil. Anita, her husband, the local Sarpanch and representatives and founder of Sulabh International Social Service Organisation, Dr. Bindeshwar Pathek were invited to Rashtrapati Bhavan on March 20, 2012. Her insistence on having a toilet at her in-law’s place not only compelled her husband to take up the issue with the local Panchayat but also made Sulabh International adopt Anita’s village for its “Total Cleanliness Drive”. The Panchayat of her village came forward in organizing funds for the construction of the toilet. She returned to her in-law’s place only after a toilet was built. Madhu Kumari, an aspiring footballer from Patna, and her family of five was solely dependent on her elder brother who runs a roadside tea shop. Madhu used to do odd jobs for survival and to pursue the game of her choice. Smt. 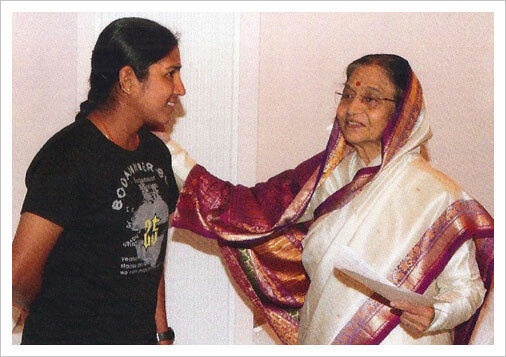 Pratibha Patil, being an admirer of sporting talents, was keen to help her out. The Government of Bihar was approached and a special sports quota in a government job was created, not just for Madhu but also to encourage many other aspiring sportspersons. Madhu received her appointment in March 2011. A jubilant Madhu met Smt. Pratibha Patil in Pama the same year. 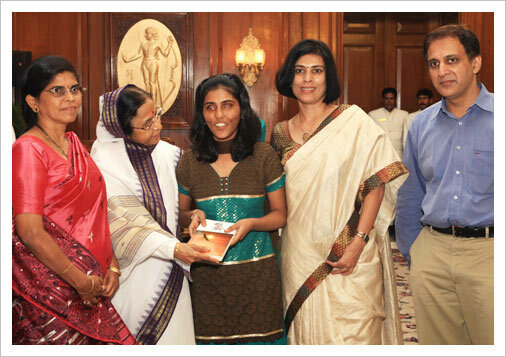 Madhu and her fellow sportspersons, who pursued the sports of their choice with a job in hand, thanked Smt. Pratibha Patil for her timely intervention. In many cases, succor provided through the intervention of Smt. Pratibha Patil has helped not only individuals but also whole groups of people. One such example is that of Saffron Public School, Phagwara in Kapurthala District of Punjab. The school located near a railway line was urgently in need of a manned level crossing for the safety of its students. The school approached Smt. Pratibha Patil’s Secretariat and as a result of the interest shown by her, it was possible to start the construction of the manned level crossing in 2011. Aparna lost her husband in an accidental cannon blast in a temple ritual, under the management of the Bardhaman district administration in West Bengal. This tragedy shattered her life. Her in-laws had no means to look after her and her infant child, and she was forced to come back to her parents for support and survival. Her retired father had to stand up and fight for justice for his only daughter and moved from pillar to post for the last 13 years. With Smt. Pratibha Patil’s intervention, Aparna was given a job in her hometown, Bardhaman, on compassionate grounds by the government of West Bengal in November 2010. Her intervention helped Aparna to regain the self-confidence and is now able to support her teen-aged son. Anita Munda, a poor tribal girl from a small village in the Jalpaiguri district of West Bengal on the Indo-Bhutan border with Smt. Pratibha Patil’s intervention could get her college admission and the Government of West Bengal also came forward to bear all her education-related expenses. Padma Ruidas, a minor girl from Bankura in West Bengal who resisted marriage at an early age and had to leave her studies after class IV due to extreme poverty could get a new life with Smt. Pratibha Patil’s helping hand when a local NGO Came forward to admit her again to a school. Namit Bahadur, the young boxer from Jamshedpur and winner of the Bronze Medal at the World Junior Boxing Championship at Yerevan, Armenia, was fighting against all odds because of his extreme poverty to pursue the sport of his choice. Smt. Pratibha Patil was keen that he should be able to realize his dream. Following this, help started pouring in from different agencies and also from the Government of Jharkhand to help him become a professional boxer. Namit’s joy knows no bound and he joined the Indian Navy and professional boxing at the international level. The young tribal boy BayaMankidia had to trek 13 kilometers every day to reach his school. Baya became the first matriculate from his Mankidia tribe scattered in the forests across Orissa’s Mayurbhanj, Sundargarh and Sambalpur districts. Smt. Pratibha Patil congratulated the boy on his remarkable feat and ensured that the boy continues his education. The District Administration of Mayurbhanj came forward to help him and granted a scholarship for his higher education. Losing all hope for the medical treatment of his four sons, afflicted by muscular dystrophy, a genetic disease that has confined them to bed, Jeet Narayan sought permission from Smt. Pratibha Patil for the mercy killing of all his sons. She was deeply touched by the plight of the children. The District Administration, Mirzapur, came forward to provide all help to the suffering children and the family. The family saw a new a ray of hope and receive some respite from their struggle for survival. The ParamVir Chakra winner Bana Singh, with the intervention of Smt. Pratibha Patil, got his grievance redressed with the enhancement of his pension. Atul Haldar risked his life to save 150 Indian soldiers from being swallowed by the turbulent Ichhamati River during the 1965 Indo-Pakistan War. Haldar was awarded the Shaurya Chakra and a meager monthly pension. Deserted by his four sons and incapacitated by a cerebral attack last year, Haldar was confined to his bed and was unable to meet his medical expenses. Smt. Pratibha Patil came to know of his pitiable condition and reimbursed his immediate medical expenses and the State. Government arranged for his free treatment at the local District Hospital. The Soda Rajput Community living in Pakistan used to face difficulties in firming up matrimonial alliances in India within the limited period of the visa of one month. Smt. Pratibha Patil took note of this humanitarian problem and the period of the visa for the Community was allowed to be extended by the Ministry of Home Affairs and Ministry of External Affairs up to together six months under certain conditions by the Foreign Regional Registration Office/District Magistrates of the four districts of Rajasthan namely Jaisalmer, Barmer, Bikaner and Jodhpur under special delegated powers. Kuldip Singh’s presence of mind saved the lives of many Delhites during pre-Diwali bomb blasts in 2005. Kuldip was severely injured in the blasts and was in urgent need of medical help and in dire need of financial support. Smt. Pratibha Patil wanted to ensure that a brave man like him who had shown exceptional courage should be a shining example to others. Kuldip was given a permanent job in the Delhi Transport Corporation (DTC) as a Vehicle Examiner, an out-of-turn allotment of Government accommodation and also a sum of Rs.2 lakh as compensation; as well as a hearing aid from the DTC. Smt. Pratibha Patil’s attention was caught by news reports regarding Octogenarian and former Dean of Delhi University’s Law Faculty, Mrs. Lotika Sarkar who has been put to hardship because of some dispute over the ownership of her house. Smt. Pratibha Patil expressed her anguish over the mental trauma faced by Ms. Sarkar, who has no offspring to look after her. A group of Sarkar’s friends and well-wishers led by noted historian and MP Ms. Kapila Vatsayan met Smt. Pratibha Patil. Her intervention helped the octogenarian widow to spend the rest her life peacefully in her own house. When news about the illness and financial condition of veteran actor, A. K. Hangal, came to the notice of Smt. Pratibha Patil, she helped him meet his urgent medical expenses. He was overwhelmed by the gesture of Smt. Partibha Patil and profusely thanked her for the prompt aid. Smt. Pratibha Patil took note of the news report that Manjuma Iqbal, who was awarded the Uttam Jeevan Raksha Padak for rescuing some children from drowning and risked her own life, was not extended due honour, while the award was given away to her by the District Administration, Varanasi. Smt. Pratibha Patil’s intervention helped Manjuma receive her award in an appropriate manner from the Government of Uttar Pradesh. Bulti Bagdi walked out of her wedding ceremony when she found her bridegroom drunk and demanding more dowry from her father when the marriage solemnization was about to begin. Her protest led the bridegroom and the marriage party to make a hasty retreat since Bulti’s neighbors also came to her support. Smt. Pratibha Patil came to know about the brave act of this poor tribal girl and commended her action which is an inspiration for all young women. The State Government and other organizations came forward to help the girl and her family.